XDubai, the ambassador brand for action sports around the around, is no stranger to creating amazing stunts in the UAE. We’ve seen the world’s best wakeboarders shred the calm waters in Madinat Jumeirah, XDubai kiteboarders leap off of Burj Al Arab, and we’ve even witnessed the XDubai crew throw a man off Princess Tower. 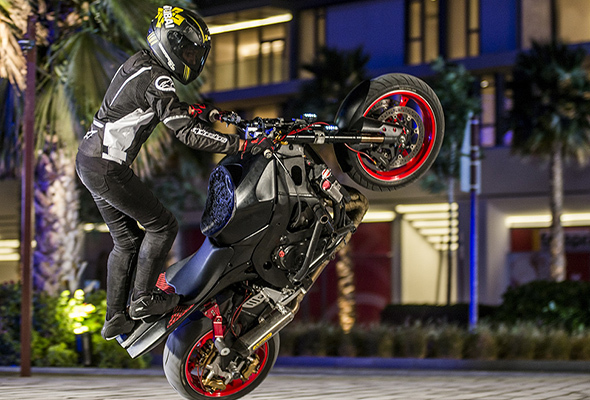 In their latest video, 26-year-old French athlete and Hollywood stunt rider Sarah Lezito performs various stunts at the stunning new island destination from Meraas. In the nearly two-minute-long clip, released on Bluewaters’ YouTube channel, Lezito showcases her world-famous skills, performing technical stunts that include stand-up wheelies, dead-spins, drifts and circle combos with Dubai’s impressive skyline as her backdrop, and under the gaze of Ain Dubai, the world’s largest observation wheel. Throughout the video, Lezito’s identity remains hidden as she expertly transverses the streets, making her way through the island’s residential, retail and hospitality zones to meet friends at Caesar’s Palace Bluewaters Dubai. 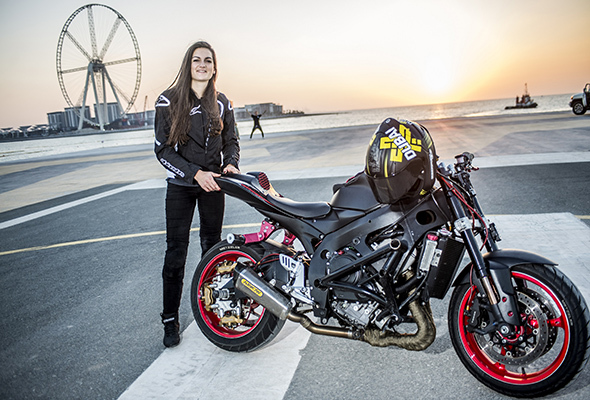 Lezito is XDubai’s first motorcycle stunt rider and one of six women signed by the action-sports brand. “As an athlete at the top of her game, Sarah shows us what it means to defy your limits and we couldn’t think of a more fitting location than Bluewaters to officially announce that she is part of the XDubai family,” said Mohammed Javad, General Manager of XDubai. Lezito joins a select group of men and women athletes representing a variety of action sports including skateboarding, parkour, obstacle course racing, BMX and motocross.